The legendary “Steve Miller Band” will release “Steve Miller: Live From Chicago” on Coming Home Studios label in the UK on Monday 2nd June. The 3-disc set boasts two DVDs and an audio CD. The first DVD features 20 classics performed live including some of Steve Miller’s biggest hits including The Joker, Fly Like An Eagle, Abracadabra and Take The Money And Run. DVD disc one features the live concert which has a running time of 110 minutes. DVD disc two boasts over 45 minutes worth of bonus features including a never-before-released documentary encompassing a private tour of Chicago featuring Steve in a classic checker taxi cab revisiting some of the first venues he performed in when he was known as Kid. The bonus CD features 12 songs including Keep On Rockin’ Me Baby, Living In The USA and Wild Mountain Honey. 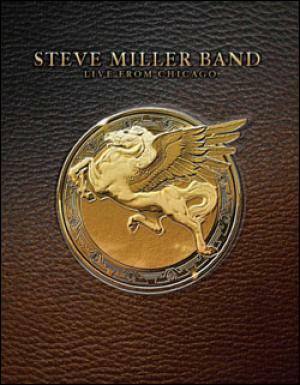 “Live From Chicago” is the first time Miller has released a DVD, and is also his first “official” live music release in many years. “Live From Chicago was filmed in high definition with 32 cameras, over two sold-out nights at the renowned Ravinia Chicago concert venue, in front of 35,000 people during the Summer 2007.